The water temperature in Nelson Bay varies throughout the year with the temperature influenced by seasonal fluctuations, and by offshore currents, particularly the East Australia Current (EAC), which brings warm water down from the Great Barrier Reef. 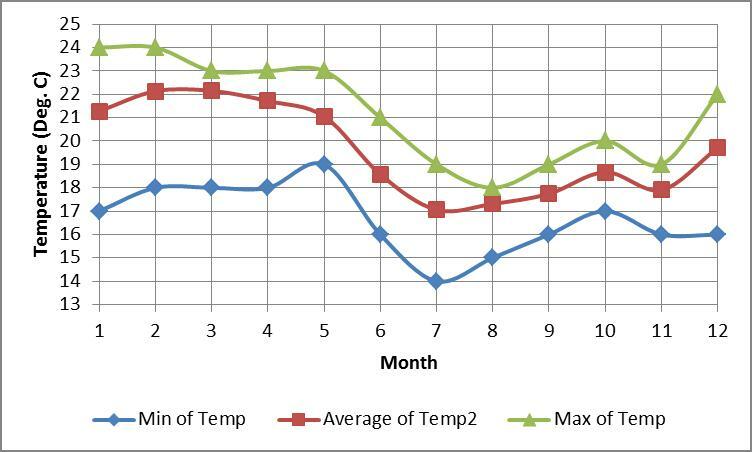 The plot here shows a graph of the maximum, minimum, and average water temperature each month, in Nelson Bay, taken over the last 3 years. If you want warm water in the bay, then it is best to visit in late summer or spring when temperatures are typically in the low twentys. The variation in water temperatures has a dramatic effect on marine life in the bay. It influences the growth of algae and causing variations in fish and invertebrate life. The plot here shows the effect that changing water temperatures has on the number of fish species recorded on RLS surveys at the Halifax Divesite during 2011. It is clear that water temperatures are strongly link to fish diversity with more species encountered in spring when the water is warmest.